This is the second Alternative Tentacles release of Mumia Abu-Jamal recordings and commentaries. The case of Mumia is one of the most disturbing and tragic in the second half of the twentieth century. He is one of the most high profile of America's political prisoners. While the U.S. government debates the continued extension of most favored nation status to China because of their continuing imprisonment of political dissidents they ignore those very cases in their own jurisdiction. 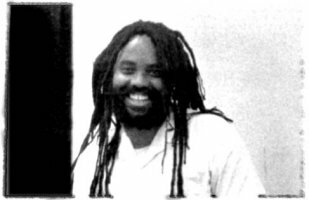 Mumia at best deserves to be freed for the governmental abuses of his first amendment rights and at worst deserves a new trial with competent representation and the admittance of all new evidence in his case. His initial arrest may have been a result of his being a viable suspect in the murder of a police officer (he was in the wrong place at the wrong time) but his conviction and subsequent silencing is obviously more a reaction to what he says than what he did or did not do. His words are terrifying to those entrenched in power. His opinions could bring about revolution. A revolution where the expansion of civil rights is finally completed. Where minorities and the poor are finally given a legal voice that can be heard as clearly as those of the wealthy. He is a threat to the state not only because they fear his ideas may topple them from power but because they fear the backlash that might happen against those who are currently in the majority. The irony is that without a leader and a voice like Mumia, the backlash will inevitably be worse. A man like Mumia could temper the rage of the oppressed thus helping them to not, in turn, become oppressors. If the state murders and martyrs him, they will have killed a man who may one day have saved them.